Plate magnets are designed to capture unwanted ferrous metals from your product where magnetic tubes or grates might choke/bridge the product or wear out the magnetic tubes. Plate magnets can be placed in chutes, over conveyor belts and below conveyor drive pulleys. Chute installation kits can include a pre-drilled piano style hinge and a handle. Installed in suspended position, plate magnets include four welded eyebolts. These magnets are provided in different strength and sizes. Product depth and the distance away from the product determine the strength. Shallower product depth provides better separation of ferrous metals from product. The size is determined by chute or conveyor belt width. The most common plate magnets are listed in the tables below. They are also offered with three different faces (collection area). Our magnetic plates are the simplest and cheapest equipment for the protection of the installations of crushing and milling. The permanent magnet provides the following advantages: no consumption of energy, constant magnetic field, no maintenance and possibility to work in any place. Plate magnets are offered with two magnetic loads. Ceramic magnetic loads are less expensive and heavier. Neodymium magnetic loads are more expensive, but high strength ones weigh much less than ceramic. 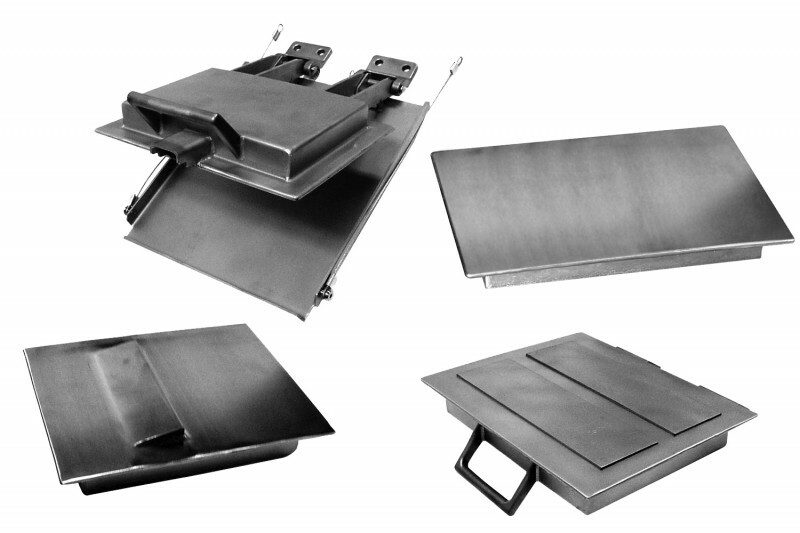 Designed for Vibratory Tables, Conveyors & Chutes. Suspended Plate are designed for effective tramp metals extraction from the high volume material by installation above Conveyors. Using big size ferrite and properly designed configuration ensure the tramp iron can be taken from thick layer material flow by heavy duty plate. For fine metal powders in thin layer material flow, light duty plate made of rare earth magnet is available also. • Can be installed in chutes, feed tables or over conveyor belts. • Choose magnet strengths and sizes to match your requirements. • Hinged plates swing out for easy cleaning. • Self-cleaning models save downtime and labor. To have a plate magnet designed for your process, give us a call and tell us about your specifications. We will help you design an ideal model to suit your existing equipment and materials.